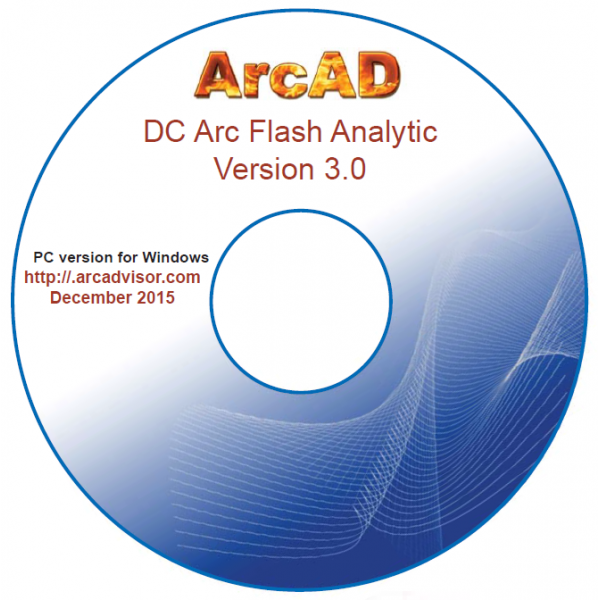 DC-Arc-Flash-Analytic version 3.0 (DCAFA V3.0) software for Windows operated PCs has been developed as an easy to use and comprehensive tool for calculating arc incident energy and arc flash boundary. 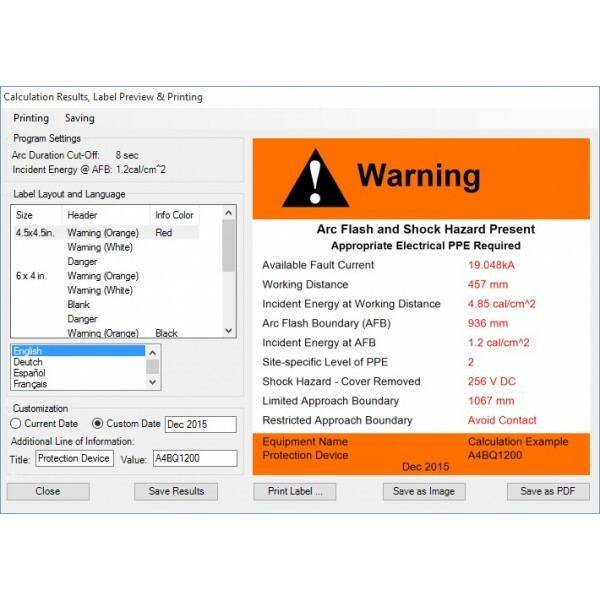 This software simplifies determining incident energy at working distance, arc flash, limited and restricted approach boundaries in DC power systems when work is to be performed on or near the energized equipment. The program performs the analysis by taking into account power system voltage, available short circuit current, circuit time constant, equipment configuration, working distance and protective device time-current characteristics. DCAFA V3.0 will also assist you in selection of proper Personal Protective Equipment (PPE) and creation of arc flash & shock hazard warning labels. The program is applicable for systems with voltages from 50 to 30,000V DC, short circuit fault currents from 100A to 20kA, circuit time constants from 0 to 50msec, conductor gaps from 1 mm. up to the lesser of 300 mm. and the maximum value where the arc can likely be sustained under the specified system voltage, available short circuit current and circuit time constant. DCAFA V3.0 takes system voltage, available short circuit current, gap between conductors, circuit time constant, protective device type and rating, or a preset arc duration value, working distance, equipment class and determines incident energy, arc flash and shock protection boundaries. Arcing current can be expressed as a function of the length of the gap and arcing voltage. Arcing voltage can be derived as a function of arcing current, system voltage and the available fault current. DCAFA V3.0 calculates arcing current using the iterative method by cycling through the equations for arcing current and arcing voltage until the answers converge. Next, the program will determine arc duration based on protective device time-current characteristics and circuit time-constant. Lastly, the program will calculate incident energy at working distance, arc flash and shock protection boundaries. DCAFA V3.0 comes complete with a built-in library of selected protection devices and the capability to extend the library. The program will determine arc duration based on predicted arcing current value, circuit time constant and selected protection device type and rating. While circuit time constant affects current rise and protective device performing characteristics, it will also have an impact on arc duration. Therefore, time current characteristic of the upstream protective device clearing the fault has to be adjusted for the time constant. If this occurs, the process of determining the protective device operating time is cumbersome. 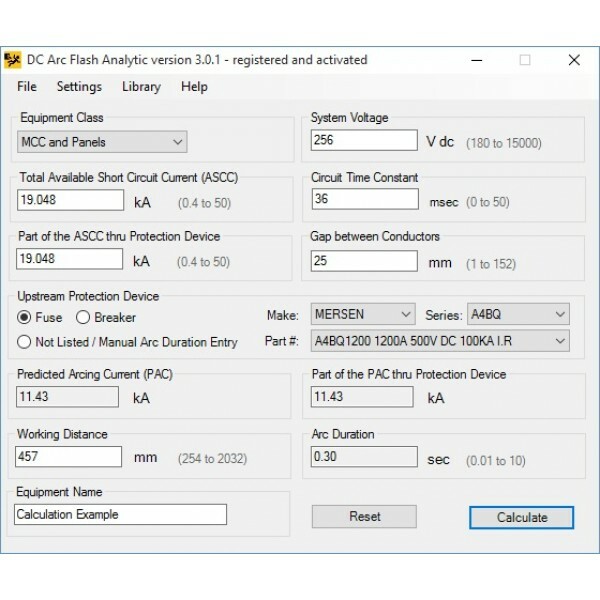 DCAFA V3.0 will cycle through relationships between the effective RMS current, available fault current, number of time constants, analytical expression for the selected protective device time-current characteristic and make proper adjustments to arc duration. DCAFA V3.0 was written in C# programming language, best viewed as a descendant of both C++ and Java languages. The language was developed by Microsoft within its .NET initiative and later approved as a standard by ECMA (ECMA-334) and ISO (ISO/IEC 23270:2006). SCA V1.0 requires Microsoft .NET Framework Version 3.5 or higher to run. If you experience problems running DCAFA V3.0 once you install it on your PC, check please if you have .NET Framework Version 3.5 or higher installed on your PC system. To see which versions are installed, view the %WINDIR%\Microsoft.NET\Framework directory. (You should also view the Framework 64 directory on a 64-bit computer, which can have 32 or 64-bit versions installed.) Each version of the .NET Framework has a directory, and the first two digits of the directory name identify the .NET Framework version; for example: v1.1.4322 for the .NET Framework 1.1, v3.5 for the .NET Framework 3.5, and so on. If there is no Microsoft .NET framework installed on your system, or the installed .NET framework version is less than 3.5, please download .NET Framework Version 3.5 link to update your system. Should you encounter any problem installing or running DCAFA V3.0, contact us and we will assist you in identifying and resolving the problem.